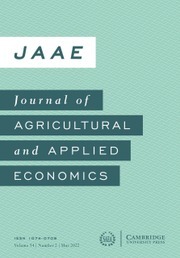 Published on behalf of the Southern Agricultural Economics Association, the Journal of Agricultural and Applied Economics is a forum for creative and scholarly work in agricultural economics and related areas. Contributions on methodology and applications in business, extension, research, and teaching phases of agricultural and applied economics are equally encouraged. As of 2015 (Vol 47), articles are published on an open access basis.